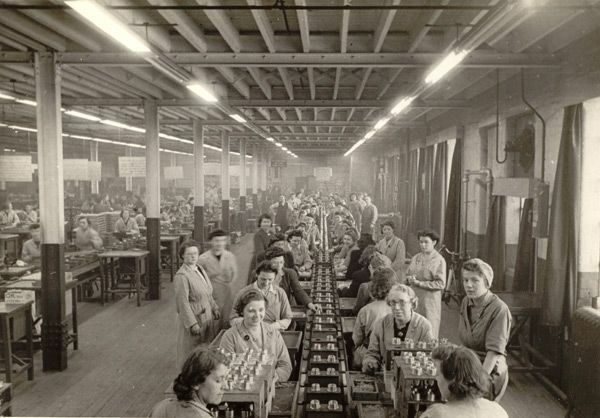 Around 950,000 British women worked in munitions factories during the Second World War, making weapons like shells and bullets. Munitions work was often well-paid but involved long hours, sometimes up to seven days a week. Workers were also at serious risk from accidents with dangerous machinery or when working with highly explosive material. In February 1944 there was a serious accident at the Royal Ordnance Factory in Kirby, Lancashire. In one building 19 workers, mainly women, were filling trays of anti-tank mine fuses when one of the fuses exploded, setting off the rest of the fuses in the tray. The girl working on that tray was killed outright and her body disintegrated; two girls standing behind her were partly shielded from the blast by her body, but both were seriously injured, one fatally. The factory was badly damaged: the roof was blown off, electric fittings were dangling precariously; and one of the walls was swaying in the breeze. Some munitions workers handled toxic chemicals every day. Those who handled sulphur were nicknamed ‘Canary Girls’, because their skin and hair turned yellow from contact with the chemical. ...there was no training. You were put into what they called small shops where they made different sizes of shells and landmines and different things like that…you were just told what you had to do, filling them with TNT. And there was a lot involved in doing them, and they had to be filled to a certain level and then you had to put a tube in which was going to contain the detonator. Then it had to be all cleaned and scraped until it was exactly the right height inside the shells or the mines. It was quite heavy work actually because they used to have like a big cement mixer, type of thing and this was hot TNT. The smell was terrible and you had to go to that with something like a watering can, and take it up. There was a chap on it who used to tilt it and fill your big can, and you'd have to carry that to where you were working and then fill the shells from that. I slipped on the floor with one of these big cans and I was covered in TNT. My eyes were concealed and everything, up my nose, it was everywhere. Some of the chaps that were working there got hold of me and put me onto a trolley and took me down to the medical place and obviously I had to wait for it to set on my face. I had quite a job getting it off my eyelashes, you know and that sort of thing. And of course my face then was red and scarred with the hot TNT, you know. They put me on the bed for an hour or something, and then it was straight back to work after that. What reasons do you think munitions workers might have had for choosing this type of war work? What do you think working on a production line might have been like? Stories of accidents at munitions factories were not always reported in the press. Why might this have been? Gwen Thomas went to rest 'for an hour' after her accident and then went straight back to work. How do you think attitudes to health and safety have changed? Analysing sources: Look at the photograph above of women working on a production line in a factory in the East Midlands during World War Two. What does it tell you about women’s munitions work? - How old are the women? - What do their ages tell you? - Does their work look interesting? - Can you see any safety equipment in the factory?